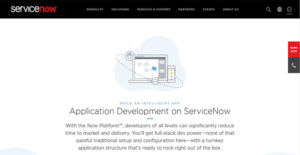 What is ServiceNow Application Development? ServiceNow Application Development is a powerful and full-featured business app creation application. It assists developers in reducing their production time and hastening their time to market with its wide array of pre-built libraries, templates, scripts, tools, and integrations. With ServiceNow Application Development, users also have access to industry-standard tools that fit with the languages and methods that they are already familiar with. On top of that, the programming process is further expedited by integrations that enable the seamless exchange of information across the organization. Furthermore, the ServiceNow Application Development platform allows users to focus more on creating functional services that would meet the needs or even exceed the expectations of their target audiences with its already responsive user interface framework. ServiceNow Application Development is a web-based platform. Therefore, developers can bring or access their work anywhere. This lets them catch up with their backlog and make sure that tasks are finished on time. With ServiceNow Application Development, developers can build any kind of application for business purposes. Their brainchild can be focused on process automation, customer engagement, or data tracking and they would still find the platform’s tools functional towards meeting the needs of their target users. ServiceNow Application Development facilitates the reduction of development time with its integrated pre-built libraries, ready-made templates, scripts, integrations, and tools. These allow programmers to create unique business process apps without having to start from scratch. What makes ServiceNow Application Development a dynamic platform is that it provides users objects that they can use on any app they develop again and again. This lets them build apps faster the next time around and ensures that there is no disposable code. Aside from functionality, it is also important for programmers to give attention to the attractiveness of the UI design and the UX it provides, as these are things that also appeal to app users. With the ServiceNow Application Development platform, developers can deliver top-notch user experiences with a simple drag-and-drop portal builder, predefined widgets, and more. If you are interested in ServiceNow Application Development it could also be beneficial to check out other subcategories of Best Rapid Application Development Software - RAD collected in our database of B2B software reviews. Every business is different, and may need a particular type of Rapid Application Development Software - RAD solution that will be adjusted to their business size, type of customers and employees and even specific industry they support. We advise you don't count on locating an ideal software that will work for every business regardless of their history is. It may be a good idea to read a few ServiceNow Application Development reviews first and even then you should remember what the solution is supposed to do for your business and your workers. Do you require a simple and straightforward app with just basic functions? Will you really use the advanced functionalities needed by pros and large enterprises? Are there any specific features that are especially useful for the industry you operate in? If you ask yourself these questions it is going to be much easier to find a trustworthy app that will match your budget. How Much Does ServiceNow Application Development Cost? ServiceNow offers a free developer instance of its Application Development platform, there are no enterprise pricing packages. We realize that when you make a decision to buy Rapid Application Development Software - RAD it’s important not only to see how experts evaluate it in their reviews, but also to find out if the real people and companies that buy it are actually satisfied with the product. That’s why we’ve created our behavior-based Customer Satisfaction Algorithm™ that gathers customer reviews, comments and ServiceNow Application Development reviews across a wide range of social media sites. The data is then presented in an easy to digest form showing how many people had positive and negative experience with ServiceNow Application Development. With that information at hand you should be equipped to make an informed buying decision that you won’t regret. What are ServiceNow Application Development pricing details? What integrations are available for ServiceNow Application Development? ServiceNow enables developers to create custom connections with third-party applications via its API and other integration tools.